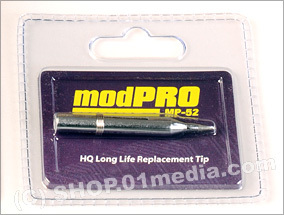 Soldering : MP-52 HQ Long Life Replacement tip for MP-51 Soldering Iron - SHOP01MEDIA - console accessories and mods, retro, shop - One Stop Shop! Iron-plated, which makes them a lot more durable than regular copper tips. 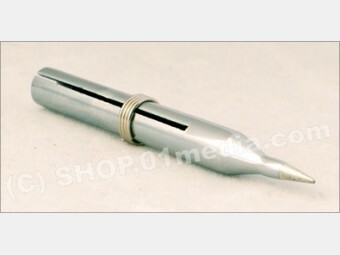 The outside chrome-plating makes them corrosion free.Iron-plated, which makes them a lot more durable than regular copper tips. The outside chrome-plating makes them corrosion free.The modPRO Long life replacement tips are excellent heat conductive soldering tips made from pure copper. All our replacement tips is factory pre-tinned, which improves the performance of the tip. A good long life tip decreases solder joint failure and increases soldering production. 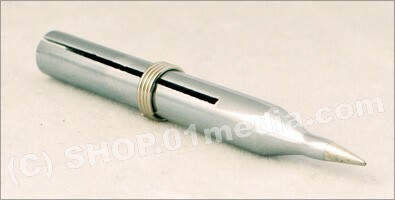 Please notice: Long life tips cannot be filed as this will damage the tip structure.